These meatballs cook up juicy and flavorful, and you need not limit yourself to turkey. I make these regularly using lean grass-fed beef, lamb or pork. You can serve them on their own with a little ketchup or sweet and sour sauce for dipping, or add them to a marinara sauce over noodles. One of the reasons kids love them is that they’re slightly sweet thanks to the grated apple, and it’s the apple that helps keep them juicy, too. Kids may also like them because the size is perfect for small hands and fingers. 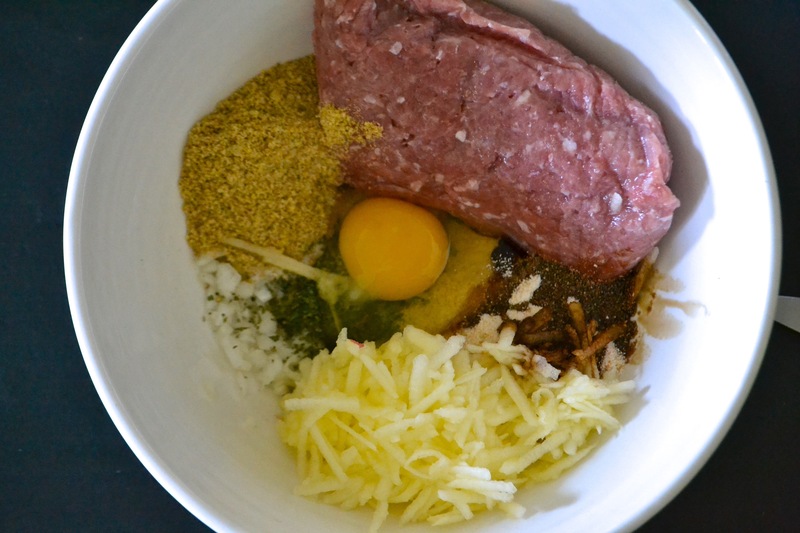 Combine all of the ingredients except the oil and flour in a medium size bowl. Heat a large cast-iron skillet over medium heat. Swirl in 1-2 tbsp to cover the bottom of the pan. Put the flour in a small bowl. 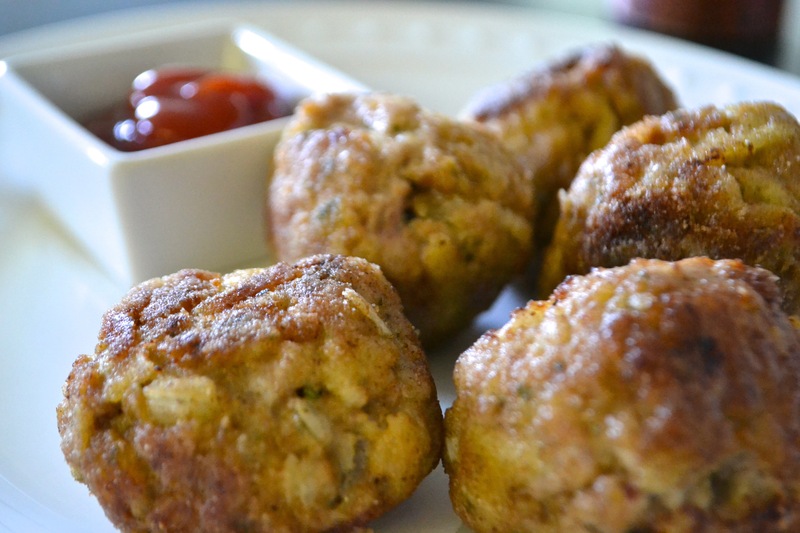 Gently form 1 1/2-inch diameter meatballs by lightly rolling a spoonful of mixture in your hands. Coat in flour and add to pan. Finish making balls using all the mixture. 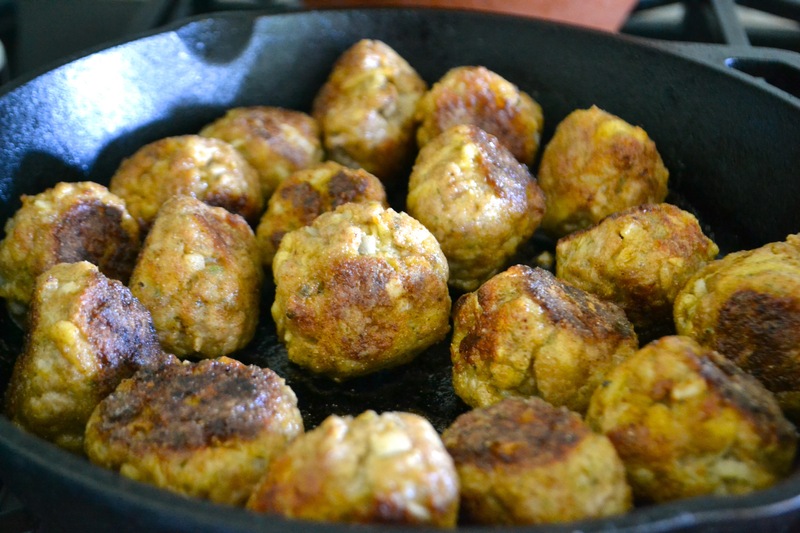 Using tongs or a spoon, turn meatballs occasionally until lightly browned on all sides and cooked through*. Place on a plate covered with paper towels. Serve warm. Makes 18-20 meatballs. The meatballs, once thoroughly cooled, can be stored in the freezer in ziplock bags. If they’re kid-approved they get my vote! I’d love to hear the outcome if you try making/serving these. As I mentioned, the grated apple gives a little sweetness, and the soy and bouillon add lots of flavor. Looks yummy, I love to use turkey in tacos, too!